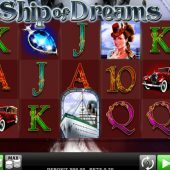 Ship of Dreams slot is a game from undoubtedly the developer most renowned for high volatility, Merkur. You won't be disappointed as we sail across the ocean on the good ship Britannia with a theme that in all but name is surely based on the Titanic as we will see shortly. You have the usual hum-and-tap Merkur sounds as the reels spin and land, and you are spinning with the reels set into the bow of our giant Ocean Liner. Will Ship of Dreams make waves for you, or find itself run aground? We start with a 10 pay line game over the standard 5 reels of 3 rows each. Now you remember I mentioned the Titanic? Well you'll see why as the symbols all seem to come from the film of that name. The top-paying icon is the redheaded Lady paying a huge 500x bet for 5-of-a-kind followed by the bearded Captain at 200x. We have the vintage Rolls-Royce and the giant blue Sapphire Pendant (where did we see that before?) both paying 75x bet. The card values make up the remaining icons and pay either 15 or 10 bet for the 5. The picture symbols pay for 2-of-a-kind and the card icons 3 or more. Any experienced player will know these awards and yes, you're correct and know what's coming next! The final symbol is the Ocean Liner Britannia, which is a non-multiplying Wild and appears on all 5 reels. 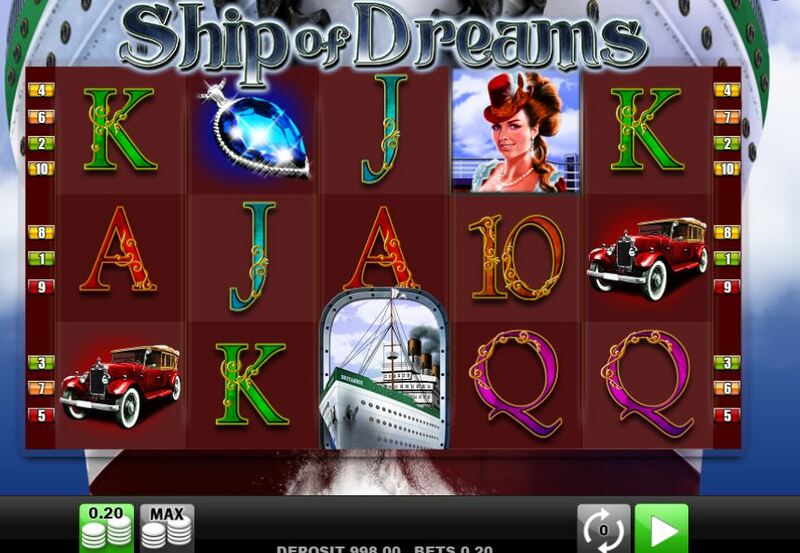 If you land 3 or more in view you will trigger 10 free games with a special expanding symbol chosen for you in a puff of steam from the ship's funnel. Unlike the base game 2 or more picture icons or 3+ card values will pay as scatters where ever they land, and as they expand you effectively get the award over all 10 pay lines, in other words a 10x multiplier. For example your icon chosen is the Redheaded Lady, and she lands on reels 2 and 5 - she will expand thus awarding a 1x bet win for 2-of-a-kind over all 10 pay lines. You can of course retrigger the games, but unlike Magic Mirror Deluxe, you don't get another expanding symbol added but remain with the original one selected.